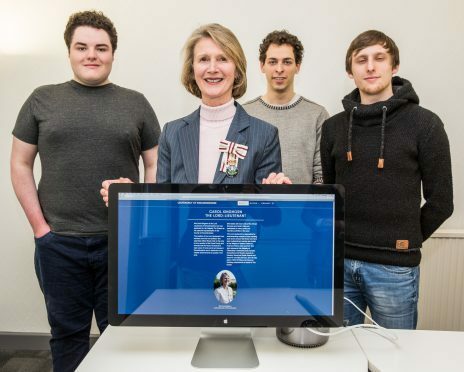 Students from a north-east university have put their IT skills to the test after being tasking with creating a website for the Lord Lieutenant of Kincardineshire. Computing students from the Robert Gordon University (RGU) in Aberdeen are helping design the site for the current holder of the position, Carol Kinghorn. Brandon Torrie, Piotr Starzec, Adrian Grzywaczewski and Yoan Montoya worked together on the project as part of the university’s Talent Exchange initiative. The programme provides opportunities for small and medium enterprises to access the skills and knowledge of RGU students in ways that are tailored to the specific needs of an organisation. The students used RGU’s tech digital incubation centre to carry out the work, building a cross-platform website. The project was carried out under the direction of senior lecturer, Liz Coulter-Smith. Digital media student Mr Torrie, 20, said: “The experience of working with real clients is incredibly valuable, as was learning how to work with programmers in commercial work. “We wanted to make a website that was far better than the others out there and I am very happy about the work my team has done for the Lord Lieutenant. Mrs Kinghorn added: “We are tremendously pleased with the result of the website. It is very user friendly, it is easy to navigate and the fact that you can access it from various platforms is great. It is exactly what we wanted.